then these members, who, we hope, left your community because of their consciences, are being described heatedly as "rebellious gangs, blasphemers and enemies of the church." We have no way of knowing whether they were bad seeds among you or whether they still are. However, beloved ones, do you all want to cast each brother into one class and take part in an arranged decision which could make things difficult for you in your last hours and ultimately on the last day? — Do you see the need of a pressed conscience, which must sense the righteous Christian when he becomes confused about his spiritual caregiver and does not want to break with him but finds no audience and must once and for all be shunned with his questions and his thoughts? — And must you discard the love that you have in your hearts for us, a love which you are duty-bound to have even for us, just to think of us in the worst of terms and separate yourselves from us? — Don't you think that we would gladly have you as well as the ones who turned to us after what we heard communicated from those who left Pastor Grabau? — Just as we gladly excuse you for more than one reason so we rely upon your love of truth that you may at least examine the testimony we lay here before you. Therefore ask God that He may impart to you the spirit of truth, which leads the way to all truth and do not look to men, or to us but look at the issues, look at God's word; for only this can make us holy and only after the day we are judged will it be known whether we kept purely and truly to His word and steadfastly believed. — And should you come to the same conviction as us concerning these points of doctrine, which we hope for your sake you can, then be not afraid to confidently profess this conviction for our loving Lord Christ will bestow true courage and indeed righteous wisdom upon you! It would be truly unwise to merely sound the alarm with the recognized truth or perpetrate schism behind the back of your pastor. No, go righteously and in the fear of God to him, examine yourselves humbly and deliberately concerning that which you have found to be different in our explanation as it has been possibly related to you. Do not seek dispute but truth, unity and peace and do not take offense that we ourselves use harsh and punishing words against your shepherd; we can assure you before God that it is the affair which we must take to task for we are enemies to no one and we have no passionate demands other than that we want your teacher to be united with us firmly and fraterally in the grounding of pure truth. Should it come out differently as it appears before human eyes and for the sake of conscience you stand firmly on our side, endure what God lays before you patiently and know that in all times for the sake of true confession similar sufferings have been visited upon your brothers in the world. God orders your affairs, so place your hope in Him for He will make things right; and if you want advice and encouragement from us after repeated and useless attempts at objective understanding, our hearts are ready to serve and stand by you as long as God helps us. then know that for your sake we will be pardoned by God on the final day; no less for ourselves than for you we are urged on all the more yet we are already overwhelmed as ministers with cares and labors. In closing we must however give a word of warning to each reader, that our words may be misused in order to place emphasis on either a perverted separation from ministerial office, or an arrogant and confused upheaval of your spiritual priesthood, or a disorderly and sectarian revolt by unqualified preachers. — You, who find yourselves upon such a path merely create shame for the true church and heartache for all righteous Christians and ministers, know that you can never again lay claim to our testimony and if you do (as indeed all fanatics and deceivers claim to have the word of God unto themselves,) you do it in foolish misunderstanding and willful blindness and mischief. Within the writings at hand here we must raise certain issues, which may exist because they have been misused or not understood by you. You are welcome to examine them with your physical senses and your thoughts. If you examine the issues quite carefully you will find that we have sufficiently defended ourselves against opposing opinions coming from you and we have taught proper obedience to the true and legitimately ordained servant of Christ, proper unity with the righteously believing church and true gospel freedom, which does not hate disciple but gladly and willingly submits to the Word of God for the sake of conscience, good church order, love and peace. But if one writes a particular book against your self-chosen path, calling you dreadful miscreants, then most certainly you heard something other than that was said. Indeed we discern certain things within your group which commit offense against best knowledge and conscience through stubbornness and certain things which are seductive and have been carried on by others who do not recognize the dangerous depths of Satan. 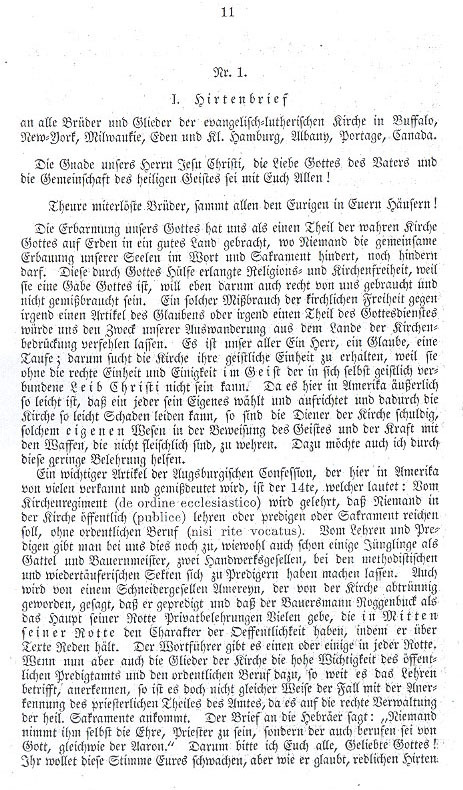 To this latter we ultimately want to warn you in all earnestness that it may turn you from your false path and, thank God for the grace He shows you, that you conjoin yourselves to a evangelical-lutheran congregation and be able to have a true spiritual caregiver who disciplines you according to God's law, who comforts and directs you in your misery through pure gospel and proper sacraments. If you search for this with your hearts and achieve it through God's mercy then you will become a new and inwardly knowledgeable people, Christian men with teachings from a holy priesthood, useful and healthy in Christian freedom with just as many needs as other Christians, who no longer live, and you may no longer wish to remain bound by law but rather wish to stand in grace, no longer as men but as servants of Christ. confusion! May He steer away from and defend against all sectarianism and schism, all tyranny and spiritual and physical human misery! May He bring back what was lost, seek what was discarded, heal what was wounded, bind what was torn apart! May He allow us to fight the good fight in the faith of our pious, dearly departed forefathers, bring many good fruits in the service to our progeny and when our final hour comes may he lead us from this vexatious world to peace through our Lord Jesus Christ. Amen. Altenburg, Perry County, Missouri, in October 1848. To all brothers and members of the Evangelical Lutheran Church in Buffalo, New York, Milwaukee, Eden and little Hamburg, Albany, Portage, Canada. May the grace of our Lord Jesus Christ, the love of God the father and the fellowship of the Holy Spirit be with you all! Dear brothers in salvation and to all the members of your houses! The mercy of God has delivered us as a part of the true church of God on earth to a good land where no one hinders the communal edifying of our souls in the Word and the sacrament and where no one may hinder us. This religious and church freedom, obtained through the help of God, wants to be properly used by us and not misused because it is a gift of God. Such misuse of church freedom in opposition to any article of faith or any part of godly service would deprive us of our reason for our immigration out of the land of church suppression. For us all there is one Lord, one faith, one baptism; thus the church seeks to maintain its spiritual unity because it cannot exist without true unity and communion in the spirit, which in itself is spiritually tied to the body of Christ. Here in America it seems so easy to choose one's own way and direct one's own course yet because of this the church may easily suffer harm, therefore the servants of the church bear the burden of defending its continued existence in the testimony of spirit and the power of non-physical weapons. To this end may I be of assistance through this humble lesson. 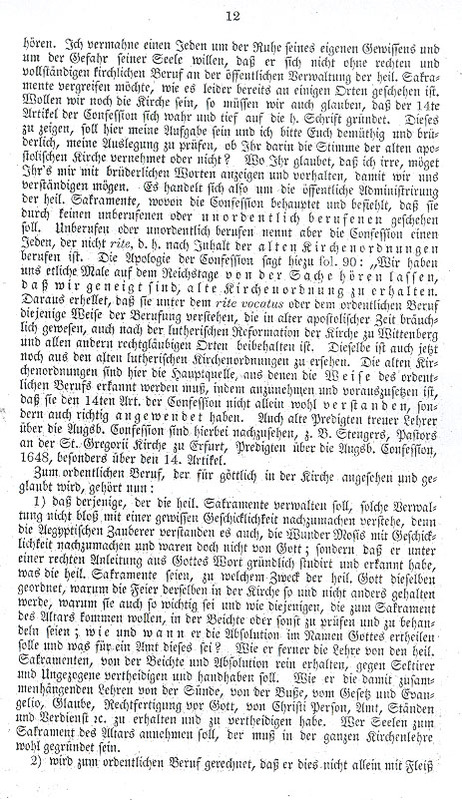 An important article of the Augsburg Confession, which is recognized and misinterpreted by many here in America, is the 14th, which states: Concerning church hierarchy (de ordine eccesiastico) it is taught that no one in the church may publicly (publice) teach or preach or administer the sacraments without ordained vocation (nisi rite vocatus). Yet there are still some among us who have been allowed to teach and preach and appoint themselves to the ministry among the Methodist and rebaptising sects, including some adolescents as well as a married couple, a master farmer and two journeymen in the trades. It's also been said of a journeyman tailor named Amereyn, who revolted against the church, that he preached and that the farmer Roggenbuck, as the head of his gang, gives many people private instructions which then become public among his gang since he holds discussions concerning text. There's always one or more spokesmen in every gang. Now if the members of the church recognize the great importance of public preaching and ordained vocation with regard to teaching, isn't it similarly the case with the recognition of the priestly part of office concerning the proper administration of the holy sacraments. The letter to the Hebrews states: "No one shall take upon himself the honor of the priesthood unless he is called by God, as was Aaron." Thus I ask you all, beloved of God! You wanted to weaken this voice of yours yet he believes you wanted to hear discursive shepherds. I warn everyone for the sake of the peace of his own conscience and the peril of his soul that he may not take upon himself the public administration of the holy sacraments without proper and complete church appointment as it has unfortunately occurred in several districts. If you still want to be the church you must also believe that the 14th article of the Confession is truly and deeply rooted in holy scripture. To demonstrate this will be my task and I humbly and fraternally beg you to examine my explanation as to whether or not you still hear the voice of the apostolic church? If you believe that I am in error, may you show and reprove me with brotherly words so that we may understand each other. This deals with the public administration of the holy sacraments, about which the Confession maintains and orders that it should not be administered by the unappointed and the unordained. The Confession names someone unappointed or unordained who has not been appointed through the ritual (rite); that is, appointed in accordance with old church orders. 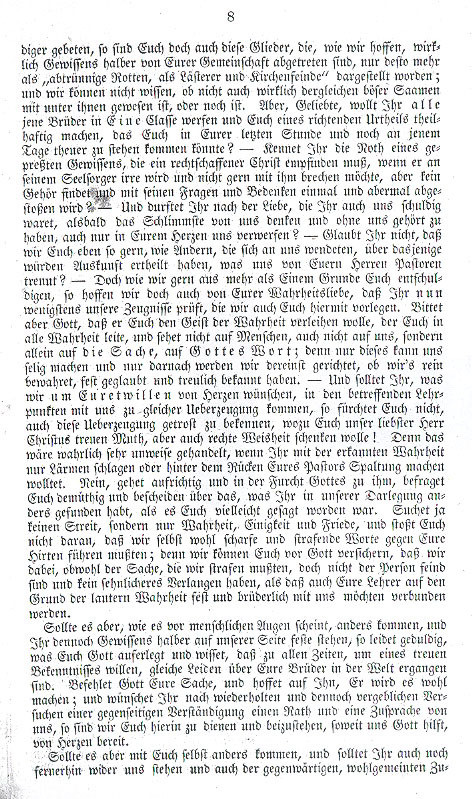 The Apology of the Confession says to this (fol. 90): "We have heard several times at the Imperial Diet about the issue that we are inclined to hold to the old church order." Thus it is elucidated that they understand under the term rite vocatus or ordained appointment the manner of appointment which was used in the old apostolic times, which is also maintained by the Lutheran Reformation of the church in Wittemberg and all other true-faith places. The same is discernible even today in the old Lutheran Church Orders. 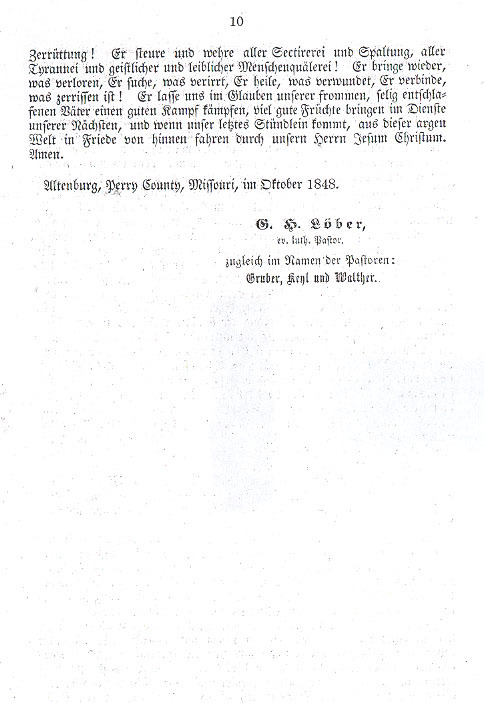 The old church orders are here the main source from which the manner of ordained appointment must be recognized, assuming and provided that they not only understood the 14th article of the Augsburg Confession but also properly employed it. 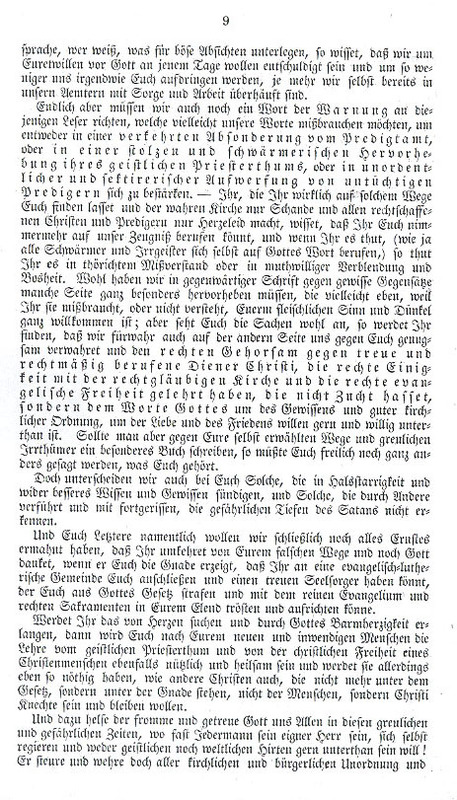 Indeed old preachers of the true teacher may be consulted concerning the Augsburg Confession, for example Stengers, Pastor of the St. Gregory Church in Erfurt, sermon on the Augsburg Confession, 1648, especially with regard to the 14th article. 1. that anyone, who shall administer the holy sacraments, shall not merely understand how to imitate the administration with a certain dexterity as the Egyptian dilettantes understood it, adroitly imitating the wonder of Moses; this was not from God. Rather he shall study and gain a fundamental understanding of God's Word under proper guidance as to what the holy sacraments are, to what purpose they have been ordained by God, why they are so important, and how each should come to the sacrament of the altar, in confession or otherwise to be examined and managed; how and when he should impart absolution in the name of God and what this office means. He must have clear understanding of teaching concerning the holy sacraments, of confession and absolution so he may defend and manage against sectarians and the ignoble. He must be able to preserve and defend a comprehensive doctrine concerning sin, repentance, dictum and gospel, righteous assurance in God, the person of Christ, office, status and service, etc. He, who shall take souls to the sacraments of the altar, must be well grounded in the entirety of church teaching.